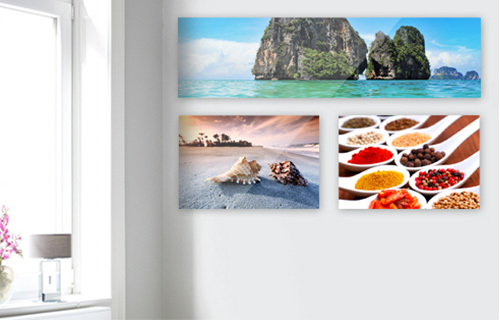 Lightweight, dimensionally stable and durable Provide Photos on aluminum Dibond a wide variety of applications. 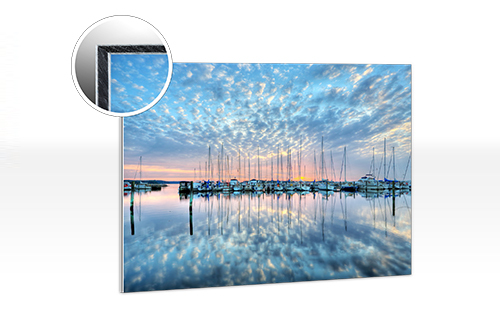 Photos on aluminum Dibond are one of the most classy ways to put pictures in scene. This modern form of image presentation will amaze even experienced photographers. Alu-Dibond consists of a plastic core and two aluminum plates. Lightweight, dimensionally stable and durable aluminum offers a wide variety of applications. Your image will be printed on photo paper and then mounted on to the aluminium board. Here we use a very high-quality printing system with seven colors. Originally developed for professional applications, this method creates a particularly elegant effect. 3 mm thick aluminum. Pressure with seven colors. Choose from our wide variety of formats. The classic 2:3 format is suitable, for example, very good for family portraits or wedding photos. Also suitable for wedding photos and group shots, as by their own family: the classic 3:4 format. You like still life and animal or flower photos? Then the square format is ideal. With the panoramic format type mainly landscapes and broad-based scenarios, a special face. 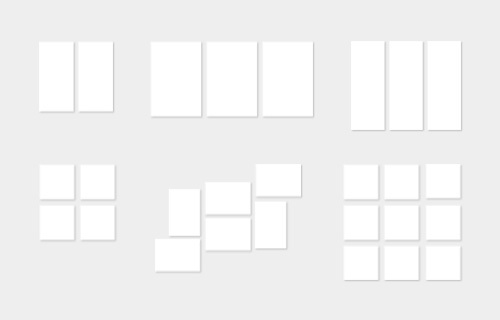 Traditionally popular formats of picture frames with deviating from the other categories pages ratios. Frame formats are especially useful for partner, family or holiday photos. With our wall bolts the image to the four corners is fixed with special screws. These are led from the front with the image so that the screw heads are visible. The distance to the wall is about 20 mm. The holes we take for you before. Info: Bolted wall mount set of 4, holes pre-drilled for mounting factory, available for the products photo on Alu-Dibond, Desktop Acrylic (Direct Print), gallery print, foam board. The classic version in the form of a rear-mounted rail system, which often comes in galleries used. The wall distance is about 10 mm and the image appears to float in front of the wall, as this wall mount when viewing the motive is not visible. Info: rail system, available for the products photo on Dibond aluminum (direct printing), gallery print, foam board. The self-adhesive mirror sheets are glued at the back hidden, and ensure that your image is optically levitating presented at a distance of about 10 mm on your wall. Foam spacers from the same distance from the wall on the lower side of your graphic. Info: Mirror plates for smaller formats, available for the products Dibond aluminum (direct printing and photo printing), Desktop Acrylic (photo), gallery print, foam board. Here you can see how the wall brackets are attached to the photos again. The easy and quick installation is easy and without any major damage to the wall. There are no visible parts, and your picture is attached particularly safe. The image floats in front of the wall. 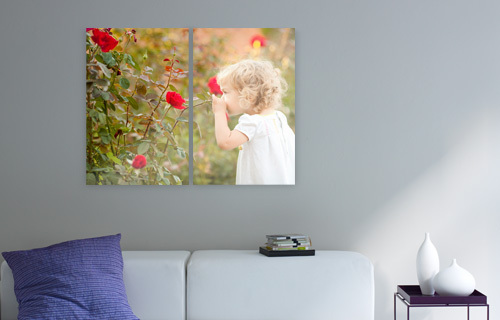 With our multi panel wall art, you can easily create customized and personalized works of art. Your photo extends over several items, such as in a triptych on three screens. We offer a wide range of possibilities. More dividers are available for various materials from our range and wall decoration in many format combinations with two, three or four parts. You choose only for a photo or select a piece of art from the Design Gallery and your favorite miniseries is finished. The individual parts hang then with 3 cm distance from each other in order to emphasize the special character. Feel free to experiment a little. You will see how classy you want in your photo with the appropriate division! All multi panel sizes at a glance! Here you can see all multi panel sizes at a glance! 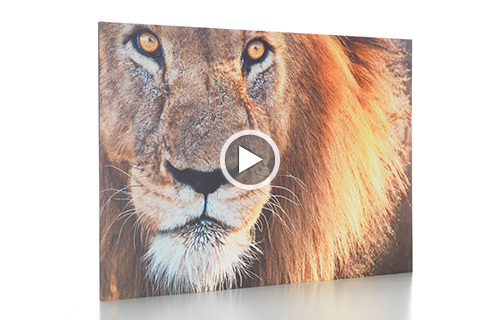 Customise your images as a multi panel masterpiece in the following products: canvas prints, XXL posters, foam board prints, aluminum prints, acrylic prints and gallery prints. Go on a discovery tour of our design worlds! Create with our huge selection of professional recording your personal work of art! Whether fabulous beaches, elaborate cityscapes or cute animals - you will find something nice. You decide what motive do you like best and we produce your individual wall decoration. You have many designs to choose from, you can clearly Browse by theme. There is always something new to discover - so worth it, often look in on us! Of course, you can also use your own photo - you have the choice!